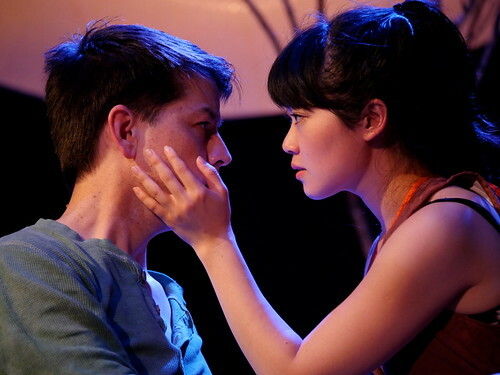 The Ferocious Lotus Theatre Company world premiere of JC Lee’s Crane is the kind of theater that makes me happy. Here’s a small company taking a step up with its first solo production. They’re tackling a notable playwright (Lee’s work has been seen locally at Impact Theatre and Sleepwalkers Theater and he’s a writer for ABC’s “How to Get Away with Murder” and HBO’s “Looking”), and with a small budget in a small theater (NOHspace), they’re making something beautiful. There’s poetry and pizzazz in Lee’s writing, which can burst with lovely imagery and depth one minute and sharp, tossed-off jokes the next. He’s telling a story of grief and romance and creativity and imbues it with the ancient and the contemporary. His is a fusion of styles that allows for straightforward storytelling and excursions into the more obtuse. Director Mina Morita matches Lee’s style with a vibrant production that blends artful with practical as she unfurls the story of a young woman leaving her grieving mother’s house and seeking her own life (and flight!) in the wider world and contrasts that with the story of a tapestry maker and his big city art dealer. The two storylines coalesce in a way that is never fully explained – is it reality and fairy tale? All reality? All fairy tale? It doesn’t really matter if, for instance, the young woman isn’t really a young woman at all but a crane (represented on stage by a lightbulb with feathers that looks a little like Tinker Bell). Perhaps she’s both. The lyricism of her story doesn’t really require such distinctions. The real world, or perhaps the outside world, is represented by a wry Leon Goertzen as Bradley’s fickle, opinionated art dealer for whom creativity is but a means to a check with lots of zeroes. We also meet Sadako’s world-weary mother and a doctor, both played by Lily Tung Crystal, and that’s really all we need to focus in on this intimate tale that turns into an unlikely love story and explosions of creativity that come at a tremendous cost. Even at about 100 minutes, Crane feels a trifle too long. There are some dramatic lulls here and there that could be tightened up, and an ongoing story about a survivor of the atomic bomb attacks on Japan trying to make 1,000 cranes so she can make a wish to overcome her radiation sickness, while central to the play, doesn’t feel as well integrated as other aspects of the storytelling. It’s there, but not quite all the way. On a set designed by Kuo-Hao Lo and lit by Kevin Landesman, director Morita and her actors craft some striking images, with the most memorable being Ho on a ladder in front of a giant moon with a spiral of lights into its center. Costumer Keiko Shimosato Carreiro gives Sadako wings – literal wings – and the image against the backdrop is, like so much of Crane, stunning. JC Lee’s Crane continues through Oct. 11 in a Ferocious Lotus Theatre Company production at NOHspace, 2840 Mariposa St., San Francisco. Tickets are $15-$35. Call 415-322-0859 or visit www.ferociouslotus.org.